I really wish I had the ability to turn a phrase like this headline once in a while. The Brucellosis testing going on is high stakes for Montana cattlemen and is being watched closely by many people concerned with the issue. I've talked about the producers involved in Bridger losing their entire herds of cattle to this, they will be killed, and there is no guarantee of reimbursement of any kind. They just have to eat the loss which will more than likely put them out of business. I see the USCA has adopted a policy that seeks indemnification program for affected ranchers. "The U.S. Cattlemen’s Association urges the Department of Interior and USDA to indemnify ranchers for losses suffered as a result of herds being infected by wildlife," noted Kiker. "The financial losses for individual ranching operations affected by this disease could be catastrophic, to say nothing of the negative economic impact on the entire livestock industry within an affected state." I doubt anything will come of this since the Federal Government does not want to take responsibility for their reservoir of Brucellosis infection in Yellowstone National Park but at least there is somebody working on the issue. The proposal makes sense too. The Brucellosis infection in the cattle more than likely came from the Park so the Federal Government is responsible. The Federal Government is responsible for the wildlife in the Park and since they don't want to do anything about the Brucellosis problem with these animals, even though they require private citizens to control Brucellosis, they should be financially responsible for the chaos that ensues from their lack of responsibility. Responsibility and Government, what an oxymoron. I wonder if CSI Montana will ever find the source. 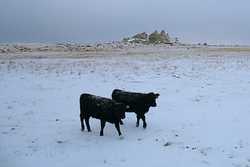 A couple of calves coming in to feed after our little snow storm. We got a couple of inches of snow is all. I guess a little is better than none at all but it sure isn't much. Taken 12/29/2006.